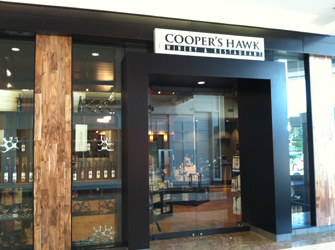 What products did Cooper's Hawk Winery use for floor/wall tile install? Cooper’s Hawk Winery and Restaurant is known for its signature menu that is designed to pair perfectly with its custom wines. Its many locations have their own specialized style and décor and always include an upscale dining restaurant, a full-service bar, a barrel-aging room, a tasting room and gift shop. When Cooper’s Hawk decided to open a new location in Merrillville, Indiana, they wanted to create a unique atmosphere that could also fit their heavy foot traffic. Cooper’s Hawk approached local contractor Ready Tile about installing wall and floor tile throughout the 10,000 square-foot restaurant. The Ready Tile team worked with Virginia Tile to secure the products necessary for the installation. TEC’s Ultimate Large Tile Mortar and HydraFlex™ Waterproofing Crack Isolation Membrane were selected for the floor tile; Super Flex™ Mortar and IsoLight™ Mortar were chosen for the glass wall tile; and AccuColor® Premium Unsanded Grout was used throughout. Because of the limited time table to complete this project, Ready Tile wanted to make sure they used products that would set fast and offer long-lasting durability. Ready Tile began the installation by using the TEC® Ultimate Large Tile Mortar to place the tile. With its no-slip, no-slump features and its superior mortar transfer to tile, the TEC® Ultimate Large Tile Mortar was perfect for the restaurant’s heavy floor tile. Ready Tile then used the fast-drying HydraFlex Membrane to form a smooth, watertight surface. HydraFlex Membrane stops in-plane cracks up to 1/4-inch wide from telegraphing through to the tile, which can cause expensive damage. Finally, Ready Tile added the highly wear-resistant AccuColor Grout to complete the stylish look of the restaurant floor. After the floor installation was completed seamlessly and on schedule, Ready Tile turned to TEC’s Super Flex and IsoLight Mortar to get the glass walls installed quickly and efficiently. They knew the products’ ease of spreadability and superior bond would eliminate the risk of the tiles slipping and breaking. The Ready Tile team first used the ultra-premium Super Flex Mortar to create an unparalleled bond with the glass. They then added the lightweight and extremely spreadable IsoLight mortar to protect the tile from up to 1/8-inch of in-plane cracking and movement. The final addition, AccuColor Grout, brought a polished look and feel to the glass wall.